Gone are the days when plant operators were required to physically turn knobs to keep their products in-spec. Now, computerized control systems, such as Eagle Iron Works Mark VI, handle the calculations for you. The Mark VI Control System can even go so far as detect when the feed changes and make the appropriate adjustments to keep the product in-spec at all times. Eagle Iron Works’ Mark VI Control System. The Mark VI Control System was designed specifically for increased productivity. Here are a few of the many ways the Mark VI can improve the efficiency of your wash plant. The Mark VI can produce up to five products, each with a different type of specification and a different number of sieves. The Mark VI’s touchscreen interface will display the split for each product. With the Mark VI, you can choose the specifications to be either percent passing, percent retained or percent cumulative retained. The specifications can have anywhere from four to 12 sieves. The number of sieves in the specifications does not have to be the same as the cell samples, nor do they have to match the sieves as in the cell samples. The Mark VI also features an unlimited specification library that allows you to quickly select a sieve group that represents for the product you wish to create. You can enter a new specification into the specification library by touching the Make New Spec button. You can also remove specifications from the library if they are no longer applicable or you no longer wish to make them. With the Mark VI, not only can you view your plant operations from anywhere in the world, you can control your plant remotely from multiple locations. The Mark VI offers tonnage prediction capabilities, and will display the product tonnage, feed fineness modulus (F.M.) and discharge modulus (D.M.) timelines. The Mark VI also creates shift reports for each product and gives production reports, tank maintenance reports, current product reports and custom product reports. It can create multiple shift reports per day. The operator has total control over which and how many reports are printed each day. With capabilities to run any number of tank sizes and configurations, the Mark VI features touchscreen technology and an Allen Bradley programmable logic controller on each tank. The screen shows 98% of the information the operator needs at one time, and all products are displayed on the screen at the same time. The operator can choose how the information is displayed — either in graph or numeric form. With the Mark VI touchscreen display, you get real-time data and results showing your in-spec product as it hits the stockpile. Manually dumping the valves. The operator simply has to touch the valve light to bounce the valve up and down to allow rocks to pass through. This feature also makes maintenance easier. Quickly changing the products the plant produces. If you need to change the products you make at your plant, the Mark VI features eight “quick buttons” that store the product change information. All the operator has to do to switch the plant over to the new products is to push the appropriate quick button. Stockpile calibration in less than a minute. With the Mark VI, you don’t have to generate special calibration piles. All the lab technician has to do is send the sample, along with the time he or she took the sample, to the operator. When the operator enters the time and gradation into the computer, the Mark VI will show what it thought it made and the sample showing what it actually made. If at any point the operator decides the two are not close enough, he or she can push a single button to recalibrate the system so that the theoretical agrees with the actual sample taken. Program upgrades and downgrades. The operator controls when the Mark VI is upgraded to a more recent version. However, if you don’t like how the new version is performing, you can revert back to the previous version of the system. Back up and restore data files. The Mark VI allows the operator to back up critical data files or restore the files to an earlier version of the data. It also allows the operator to upload files to Eagle Iron Works for diagnostics and troubleshooting. View and change calibration and station multipliers. With the Mark VI, the operator can view and change the calibration and station multipliers as well as the current specification information. The Mark VI allows you to optimize your yield by choosing to waste from different sieves as you bring your product into specification. 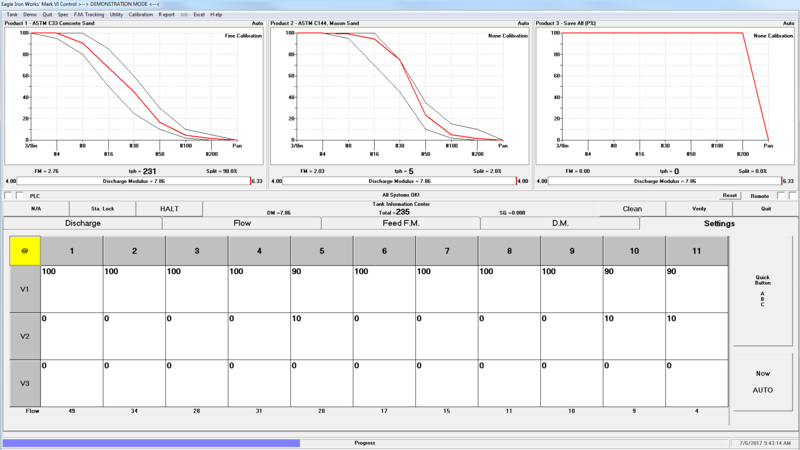 Using the Optimization feature, which allows you to toggle between Yield and Fineness Modulus, the waste can be calculated as close to or as far away from the problem sieve as possible. Try both optimizations to determine which setting, closest or farthest, generates the best results for your application. Many computer control systems can make more than one controlled product from a single feed, but these systems must also make an uncontrolled product to absorb the fluctuations. Because the Mark VI can determine when the feed changes and adjust the split as needed to remain in specification, you can generate two controlled products without an uncontrolled waste. System operations display that alerts you to the status of your tank. If operating properly, the window will display the message “All Systems OK!” If there is a problem in the tank, the window will turn red and alert you of the problem. 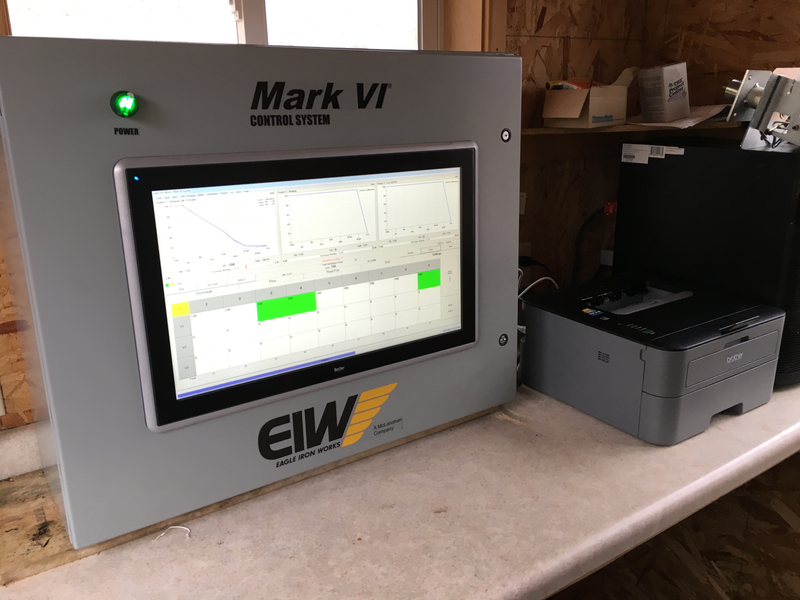 Eagle Iron Works’ Mark VI Control System gives you complete control over your wash plant at the touch of your fingertips. Touchscreen control panels allow you to assign product specifications, track your product, calibrate your stockpiles, generate reports, view real-time data and more to optimize your yield and improve your efficiency. For more information on the Mark VI Control System, .